Across several industry sectors there is a growing demand for STEM skills. This presents a huge opportunity for colleges to realign their offer to deliver fit for purpose STEM provision. However, having fragmented departments and a lack of focus on areas of economic growth impedes educational institutions from taking full advantage of these opportunities. We offer a structured and time-defined programme “STEM in Development” that can fix this problem. It enables an educational providers (colleges and universities) to have an integrated and coherent industry-influenced STEM Strategy that uniquely positions a college to deliver cross-curricular provision to drive innovation, enterprise and employability. Guided by members of our Industry Advisory Panel and the Innovation Council, we work with over 500 companies, understand their needs, technologies and practices and bring this knowledge to inform and shape college STEM strategies. Our expertise and techno-economic assessment help to align STEM Strategies with economic priorities, attract investment and address local market failures. The net impact enables educational providers to invest strategically, plan for the future, generate new revenue and create closer collaborations with business and industry. The educational provider can then play its full civic leadership role, learners have better progression opportunities, employers get the right skills they need to grow their businesses, and the community prospers. Further and Higher Education Institutions, Local Enterprise Partnerships (LEPs) and civic councils who wish to align their educational provision with the needs and expectations of local and national employers. We will analyse your current STEM curriculum and see how it aligns to cross curricula STEM developments, employer demands and your existing capabilities. This will be followed by a workshop where the information collated will be validated and areas of focus for on-going development agreed. We will then undertake a critical evaluation of your offer and how it can be reshaped to meet current and emerging employer demands. This evaluation will inform a series of STEM Recommendations within your STEM Strategy Report. 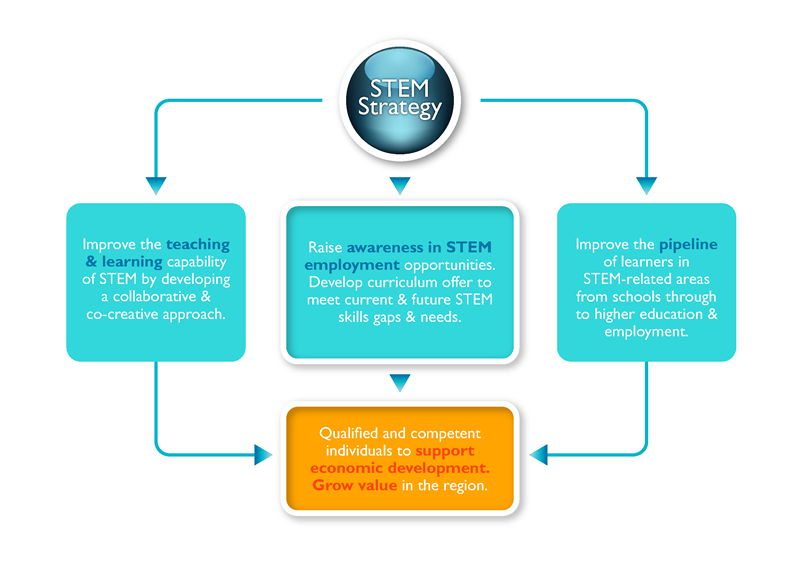 The STEM Strategy will enable you to prioritise your investment and curriculum planning. We will guide you to publish a STEM Manifesto® that highlights a series of STEM Pledges to your students, employers, governors, partners and the community at large. Ultimately, the STEM Manifesto will help you to reposition your institution as a STEM leaders and strengthen you engagement with all stakeholders. "As a result of the STEM Foundation’s work, the college now has a well-defined STEM strategy to address the skills and educational needs of our regional economy, which is heavily focused on leading edge technologies. Tyne Met College has also joined the Foundation’s Intelligent College Network (ICN) for which I have the privilege to be the first Chair." "The STEM in Development programme enabled us to structure our provision in key cluster areas that have been validated by employer demand and labour market intelligence. It also helped us to focus on where we should invest and identify cross-curricula opportunities that we might have missed. Along with our £15 million investment in a new STEM facility, this work ensured that the college's STEM provision meets the needs of employers today and in the future."